Thread: What is your favorite kattar or Jamdhar Katari? The design of this weapon from India is really astnoshing. I think it provides one of the best ways to deliver a solid piercing in close-quarter combats. Truly astonosing. This is a quality 18 Century Armor piercing Katar push dagger, forged from very nice Persian wootz (Damascus) steel. The edges are left unetched and polished in order to enhance the wootz pattern. The blade is 9 ˝ inches long, 3 inches wide. The two cross bars provide the holding and the 9 inches side bars protects the fist from a side sword hit. that´s a very nice Katar! It´s all one piece, isn´t it? I´ve always liked those, and maybe I´ll be able to forge one (or rather a matching pair) myself some time soon. But there´s also Katar with riveted blades, aren´t there? Maybe you can give me a link to Katar-construction or something? 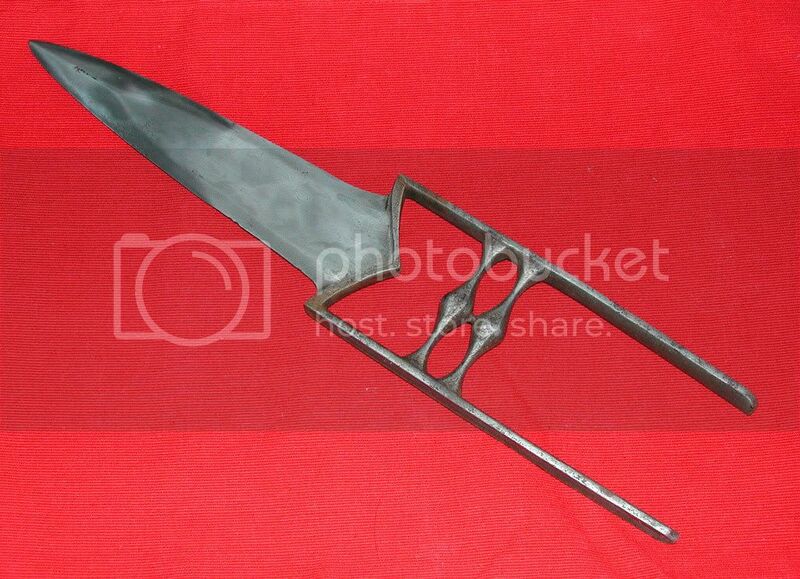 Also, can you tell me if a Katar can also be used for slicing actions, or if it´s thrust only? And lastly, can you tell me how your first name is pronounced properly? Everytime I read a post of yours it´s bothering me that I have no idea how to "think out" your name. OK, enough silly questions for now. What if the bird will not sing? Hideyoshi answers, "Make it want to sing." Hey, is that a demonic duck of some sorts?!? Yes I think it is forged of one piece. Do you forge blades? That is really great to hear. Forging blades gives one lots of insight about the mechanics of a weapon. There are also katars made of two different parts of course. Sorry I have no link, but you can ask my friends Greg Thomas Obach and Richrad Furrer, both are excellent smiths and can help you. They are regulars at SFI and surely will join in soon. I saw Gatka demonstrations and there they use katar for slicing as well for sure. Just follow German pronounciation rules and that is exactly how Manouchehr is pronounced. Thank you very much for your input on the katar. cool, I was almost right the whole time guessing the prononciation, thanks for clearing that up. Yes, when I have the opportunity, which occurs unfortunately only twice a year or so for a few weeks, I try myself at forging things, mostly sharp and pointies. I have so far forged three knives, a spearhead, a long dagger and some arrowheads. BTW, thank you for bringing all those magnificent blades to or attention, they´re always a sight to behold! Thank you very much Peter for your kind words. I would love to see your kives. Click on my website to see my gallery of blades that have a recurve. 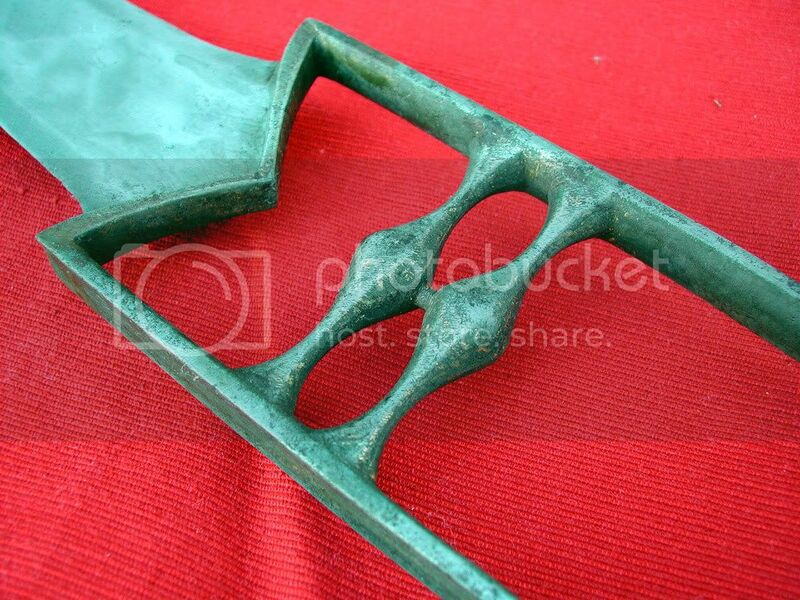 I've also got a gallery of historical Gunblades in there too. That is really fascinating. Is that handle original to the kattar? Do you have more pictures to share. While I'm not familiar with all of the various forms of the kattar I am partial to the hooded designs like this one from Oriental Arms. I'd post the pictures directly, but I'm not sure how. One of my favorite kinds of "dagger" (I guess), I've always wanted one but have never found a nice piece within my price range. Originally Posted by Manouchehr M.
As far as I can tell, this was a completely original piece. Unfortunately, I did not save any other pictures. I own only one old Katar, so this one is my favorite. Not wootz, but good carbon steel, as shown by the etch. Thanks Steve for sharing. It should be a solid blade. Do you see traces of koftegari on it? Yes, there are faint traces of gold. You can see them very faintly in the second picture. Yes Steve I see that. Really nice. I'd have to say this one is my fave...although there are several more ornate ones in Hindu Arms & Ritual that are in stiff competition against it...there's a katar in it with the hood in the shape of a peacock that's quite beautiful. It is an interesting question, although asked years ago. But it is not easy to answer when you collect katars, as each katar will be something special to you. To this comes that the collectors tast may change, like mine have. Earlier I collected decorated katars, but now I tend to collect earlier, and chiselled katars. The weapons are literally tapestries of culture. I understand you Kurt . little interest, you seem to be the only connoisseur. Here are 2 more pictures .